When learning how to trade Forex online you should look to how professional traders invest their money. How did they become successful traders on the Forex market? Are they day traders, or swing traders? Are they fund managers, or are they professional traders trading for themselves? What are the best Forex strategies they use in order to trade successfully? How did they realise that their trading strategy worked with the current market conditions? How did they adapt their trading systems to changing market conditions? What are their actual trading techniques to make their trading performances consistently profitable? How did they develop good trading habits? These questions will help you think about your situation to understand how to make money on Forex – what to do, and what not to do. Learning how to develop a profitable Forex strategy to achieve Forex success is the must-have tool to make money trading. Of course, having a Forex strategy that is profitable is useless if you’re not aware of the psychological biases that push you away from actually using your trading system. So, let’s review how you can develop a winning Forex strategy that you can stick to. 1. Which kind of trader are you? Why is it so important to figure out your trader personality profile? The power of knowing which kind of trader you are will allow you to focus your time, energy and attention on developing Forex trading strategies that work with your trading style. Sometimes the best way to make money for one trader can be a poor fit and a losing strategy for another investor. Learning how Forex trading works and how to make it profitable is hard enough, so working on strategies with the highest probability of working out for you will simplify the whole process and give yourself a better chance to succeed. Why do you want to start trading in the first place? What is your general knowledge of the markets and their correlations, trading, money management, trading psychology, trading platforms, Forex brokers and financial products? How much education will you need before starting trading? How often will you be able to trade? Will your dedicated trading time be fixed, or do you have to be flexible? What will your risk level be? How well can you control your emotions and your stress? Do you prefer to see the results of your trades within the same day, or can you wait a few days for your trades to play out? How often would you prefer to check your trades? Will you use technical analysis or fundamental analysis to determine your entry/exit setups? What amount of money can you invest in Forex trading? 2. Which trading style suits you best? Are you aware of the different trading styles? These two kinds of trading are the most active and aggressive type of currency trading, as they both imply that all your trading positions will be opened and closed within the same trading day. Day trading targets more pips and positions can be open for a few hours. Scalping trading in the FX market is about buying and selling currency pairs with a target of a few pips, held for no more than a few minutes (or even seconds). Day trading targets more pips and positions can be open for a few hours. These trading styles work with very short-term trading strategies and increase returns. Leverage is often used, which means that there is a greater risk of large losing trades. Both strategies can be stressful and require being able to stay extremely focused and available in front of the charts to make (very) quick profits. This trading style is a longer-term approach based on taking advantage of changes in the momentum of a currency pair within a main trend. It’s often considered a continuation of day trading towards position/trend trading, which is a trading style following the long-term trend of an asset. 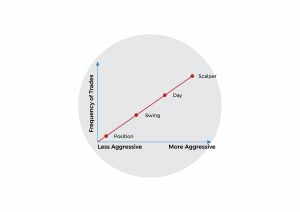 Swing trading requires a lot of patience, as you’ll be holding your trading positions for several days or weeks. It’s ideal for part-time traders, as they don’t always have the time to analyse the market. When figuring out which trading style best suits your personality, you need to take into consideration all of the following elements: your current schedule, your attention span, and your risk aversion. Consequently, you need to match your selected timeframe with your lifestyle and personality. With swing trading, you may stay in position from a couple of days to a few weeks, while using 4-hour to daily charts. With scalping and day trading you will stay in position anywhere from a few seconds to a day, using anything from 5min to hourly charts. 3. Which kind of strategy type will you use to make your trading decisions? There are a few types of trading strategies that could be a good fit for your personality. You could be a noise trader, a sentiment trader, an arbitrage trader, and a market timer, but the most common ones are technical traders and fundamental traders. Technical traders use technical analysis to analyse an asset’s price movements using past prices to forecast future price action. Fundamental traders look at fundamental factors to determine the intrinsic value of a financial asset and define if it’s undervalued (or overvalued), and whether or not the asset should be bought (or sold). A fundamental Forex trader will predominantly use news trading or currency carry trading strategies, mostly based on interest rates changes that have the highest impact on the evolution of exchange rates. 4. Which method will you follow to enter/exit the market? On the Forex market, traders usually rely on technical analysis to enter and exit the market, while still keeping an eye on the economic calendar to keep abreast of news that can affect market volatility and trigger potential trading opportunities. Once you know which kind of market analysis to use with your trading style, you have to spot and understand the market phases. There are different tools and indicators that work best under certain market conditions. This will help you determine your Forex entry and exit strategies setups. Technical analysis is based on price action trading with the help of technical indicators and charting tools, such as support and resistance levels. This type of analysis studies the past price movement of an asset to determine its future direction. We can then assume that markets always follow the same path, through different market phases and cycles. 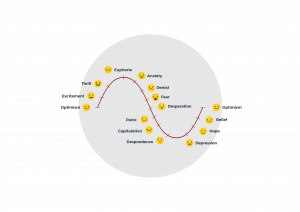 These periods describe the psychology of market participants during the accumulation, public participation, and distribution phases of a market cycle. To increase your returns, you should first recognise the market phase you’re in and know which indicators and tools work best, as they’re designed for very specific situations. When markets are rangy, this means that they evolve sideways between two nearly identical highs and lows, creating support and resistance levels. Oscillating indicators, such as MACD, RSI or Stochastic, are used to spot “overbought” and “oversold” situations, and will be more helpful to you than a momentum indicator under such circumstances. Other examples: Momentum indicators work best with trending markets and reversals, but not so much during consolidation or pullback phases, while moving averages are used during trends, but are useless during consolidation phases. When using candlestick charts, it’s essential to know about the most important Forex candlestick patterns – these can be divided into 3 main categories: confirmation, reversal, and indecision. Once you know which trading conditions you prefer to trade – rangy markets, trending markets, volatile/non volatile markets, pullback or breakout phases – you can specialise in the market phase and learn how to master the trading indicators and tools associated. Or, instead of having one single trading strategy, you could also develop several trading systems for each of the major market phases to better adapt your trading to market conditions, using specific technical indicators, drawing tools, and candlestick patterns. Determining your risk is all about knowing how much money you’re willing to lose on each trading position. Thinking about losing isn’t easy, but is necessary to be a good trader. Knowing the appropriate level of risk depends on each trader and his relationship to risk, as well as how well a trader knows themselves. Leverage is a great tool to use to increase your potential profits, but it also increases your potential losses, so use the right amount of leverage for your trading capital and risk tolerance. Read: What is Margin Trading? Why should you test your trading strategy? Once you’ve determined which kind of Forex trader you are and what kind of trading style suits best your personality, you need to test your trading strategy with historical data (back-test) as well as with current market conditions and actual trading (forward-test). This will help you be more confident that you’re using a system that makes money, as well as uncover what market conditions are most profitable. It is also practical to objectively analyse the reliability of your trading strategy and make any necessary changes to improve its efficiency before using real money on a live trading account with it. Back-testing is the testing of your trading strategy on a set of historical data, as if you were trading at that time using your selected strategy. If the results turn out to be profitable, then your trading strategy has a positive expectancy and you would have made money with it at that time. To get the best results possible, you can refine some of your parameters. However, it’s important not to tweak your variables too much, as you would be creating a trading system that’s very specific to the specific market conditions that are inherent to the particular historical data that you used. As a result, your strategy would likely fail to adapt itself to future price movements. This phenomenon is also known as “curve fitting”. While back-testing focuses on a particular set of data with specific conditions in the past (or “in-sample” data), forward-testing broadens the data on which you test your strategy, using live data (or “out-of-sample” data). Forward testing, often called paper trading, uses a simulated market environment to test your trading system under real-world conditions without putting real money at risk. It works by recording all the buying and selling trading decisions that you would make according to your trading system, and seeing what your “paper” profits would be if you had traded for real. One way to paper trade is to open a “demo” account – a trading account that mimics real-time market and trading conditions with virtual funds, so then you can determine if your strategy makes more profitable trades than losing trades. Whether you’re a novice trader, or a more advanced one, paper trading is necessary in your trading journey. As a trader with no previous experience, paper trading is great for getting used to the markets and how trading works, as well as to progress without risking any loss. If you have more experience, you may find it useful to paper trade to refine your trading system without putting money at risk. Which data should you monitor? In any case, the main goal of back-testing and paper trading is to test the proficiency and adeptness of your strategy and its capacity to maintain winning trades with positive gains. Trading expectancy and Profit factor are among the most important statistics to determine what needs to be changed in your strategy. Trading expectancy is all about the average amount of money you can expect to win/lose per trade. Knowing how much your system can generate will definitely help you better manage your expectations and emotions. Another important thing to understand is that you don’t need to target the highest win rate possible, because this isn’t necessarily indicative of a high performing strategy. The same applies to a low win rate – having a low win rate doesn’t necessarily mean that you’re losing money. It all depends on how much you win when you do! Everything has to be put into perspective in relation to expectancy. Let’s say that your trading system wins 40% of the time (therefore losing 60% of the time). Your average win is about 10%, while your average loss is about 5%. Your trading system makes money because you have a positive expectancy of $100, even though your strategy produces losing trades 60% of the time. Let’s say your trading system wins 70% of the time (therefore losing 30% of the time), while your average win is about 5%, while your average loss is about 17%. This trading strategy loses money because of a negative expectancy of -$160, even though your system produces winning trades 70% of the time. Profit factor is an easy measure of the quality of your trading system. This number can help you identify the strategy with the highest returns and the lowest level of risk possible. If your trading strategy has a profit factor greater than 1, then your strategy is profitable. However, a profit factor lower than 2 indicates that the risks you’re taking are too high for the amount of potential return. Let’s say that your winning positions have earned US$500, and your losing positions are at US$350. Your profit factor will be 1.43, which means that you’re making money, as when you invest US$1 you get US$1.43 back, which can be risky over the long term. Profit factor is an important tool when dealing with risk and money management. Moving from a demo account to a real account isn’t as easy as you might think, as there are some differences to be aware of that can affect your trading performance. These differences in trading performance are typically technical and behavioural. Demo accounts usually simulate an ideal trading environment, which is quite different from the real world. This is especially true when it comes to processing orders, execution latency, re-quotes and slippage. Trading with a demo account is, psychologically speaking, completely different – you’re not using your own money. Most traders underestimate the importance of trading psychology in their performance, emotions often take over reason and technique. Another psychological factor is the fact that a demo account will offer you more virtual funds than what you would normally use, which nudges you towards making riskier trades than what you would otherwise do in real-life. Whether you’re using a simple Forex strategy, or a more advanced Forex strategy, you need to master it before you start trading for real.